Citizen scientist Björn Jónsson processed this photo of Jupiter using data gathered by the JunoCam imager aboard NASA's Juno spacecraft on Dec. 16, 2017. Storms rage on Jupiter in a gorgeous new photo captured by NASA's Juno spacecraft. Juno snapped the picture with its JunoCam imager on Dec. 16, 2017, during the probe's most recent close flyby of the gas giant. Juno is orbiting Jupiter on a highly elliptical path and makes one such close approach every 54.5 Earth days. The new photo is a color-enhanced version processed by citizen scientist Björn Jónsson. "This image has been processed from the raw JunoCam framelets by removing the effects of global illumination," NASA officials wrote in a description of the image, which was released Thursday (Jan. 25). "Jónsson then increased the contrast and color and sharpened small-scale features. The image has also been cropped." NASA and the Juno team encourage anyone to process JunoCam data into pictures like this one. If you're interested, go to www.missionjuno.swri.edu/junocam. The $1.1 billion Juno mission launched in August 2011 and arrived at Jupiter on July 4, 2016. 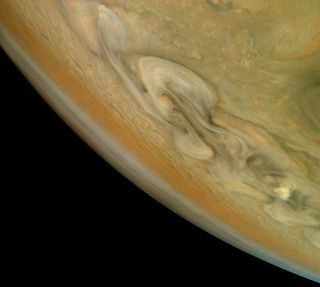 The spacecraft is studying Jupiter's structure, composition, and gravitational and magnetic fields, gathering data that should help scientists better understand how the giant planet, and the solar system in general, came together.